Pitha home made cakes. 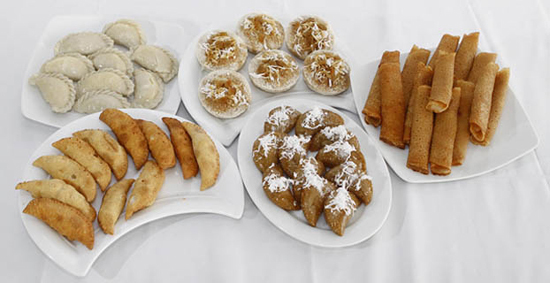 Many kinds of pithas are made in Bangladesh. These are not part of the daily menu. They are served on special occasion such as receiving bridegrooms or brides, entertaining guests, and arranging special get together of family members, relatives or friends. Sometimes children or senior members of the family especially ask for pithas and accordingly, mothers or grandmothers make them. Pithas are of many different types. In some cases, neighbouring families jointly make pithas and use the occasion for chatting and having lunch or dinner together. Most pithas are sweet and a few are hot. Some are made throughout the year but some are seasonal. Pithas of the winter season are the most delicious. Date juice and molasses from date juice and sugarcane are available in the winter. These are important ingredients of pithas that are loved by people of almost all regions of Bangladesh. The pitha season in Bangladesh starts in late autumn, when farmers procure paddy from the field. In 1991, the Shishu Academy arranged an exhibition of pithas, where 106 categories of pithas were displayed. Pithas are popular all over the country and each area has its unique type of pithas. Sometimes the same pitha has different names in different areas. Some pithas are nationally known and familiar to all. These are chitoi, patishapta, pakan, bhapa, andosha, kulshi, kata pitha, chit-pitha, labanga pitha, gokul pitha, chutki pitha, muthi pitha, jamdani pitha, hadi pitha, chapdi pitha, nakshi pitha, pata pitha, tejpata pitha, jhuri pitha, phuljhuri pitha and bibikhana pitha. The most common ingredients of pitha are rice or wheat flour, molasses or sugar, coconut and oil. Meat and vegetables are also used in preparing some pithas such as the pooli pitha, shabji (vegetable) pitha, bhapa, jhal (hot) patishapta and mangsha (meat) patishapta. Sometimes fruits (mostly, jackfruit, palmyra, coconut and banana) are also used. These pithas are named after the name of the fruit they are made from. A special category of pitha is prepared by using tree leaves as covers and are named pata (leaves) pitha. Some pithas are named according to their size. A big size pitha is called Hadi pitha, while one of the small types of pitha is named khejur (date) pitha. When a family receives a new bridegroom, it prepares some special pithas in his honour. Such pithas have intricate designs, and are colourful and attractive. One such pitha is named bibiana, which means bride's skill. Another pitha of this group is the jamai bhulana, a pitha that supposedly seduces the mind of the bridegroom. Phita is part of life and culture of the Bengali people. Nowadays, however, cakes, pastry and other food items sold commercially are gradually replacing traditional homemade pithas, especially in urban areas. But pithas still continue to attract many, even in urban areas. Many specialised shops sell costly pithas and small vendors in street corners also make their living by selling cheap pithas.